T.O.E. 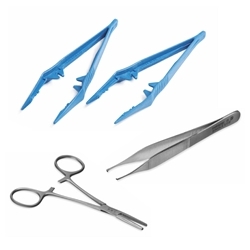 (Turnover end) Forceps 5"
Designed to grasp or hold soft tissues during procedures or to remove debris from wounds and aid the application of dressings. Spencer Wells Artery Forceps 5"
Spencer Wells Artery Forceps 7"
Hartmann Crocodile Forceps - Long - 9"